In our experience, having a Vitamix blender in your kitchen makes the challenge of achieving your health goals a lot easier. We use the 5200 model in our office to make morning smoothies, salad dressing, soups… We love it! 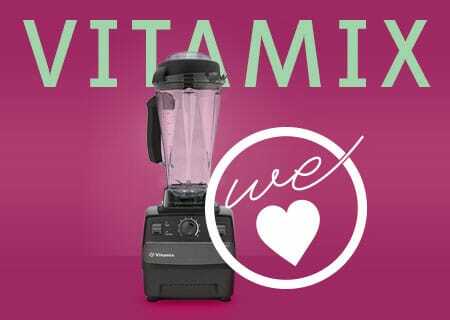 Since many of you prioritize healthy eating, and since January is a big time for rethinking our diets, we thought we'd feature Vitamix as this month’s We Heart. It's a simple tool, but it can really change how you eat. And you can get free shipping when you order through us! Click Here to Shop Vitamix with Free Shipping! Whether you want to lose weight, have more energy, decrease your risk of disease, or achieve beautiful, glowing skin, adding more fruits, vegetables, and superfoods into your diet is a good way to start. If you're trying to eliminate certain food groups, the Vitamix can also help you make gluten-free flours, dairy-free cream sauces, or homemade salad dressing (without any nasty preservatives). We find the Vitamix really helpful for getting tons of veggies into your diet, with very little chopping, cooking, or clean up. There are a lot of high speed blenders out there, but we’re devoted Vitamix fans. Why? The Vitamix is also easy to use (put stuff in container, put container on motor, blend) and since it has a powerful motor, you don't have to turn it off and on and rearrange the ingredients as you go. It just blends everything up. This $400 investment can drastically change your (priceless) health. It's made to last years of frequent use and even comes with a 7 year warranty. So instead of buying a mediocre blender that could still run you $100 or more, and might not last more than a couple years, we recommend purchasing one of these high quality machines instead. Another great facet of this company is their customer service. There are too many companies out there, even ones that make good products, that don’t emphasize good customer experiences. Vitamix is known to deal with customer issues perfectly, so if you have an issue with your purchase (hey, it happens), expect friendly and professional people to help you out. Vitamix has an amazing reputation, so you’ve probably already heard about them or maybe even thought about buying one. Now might be the right time, since they’re offering our free shipping to our customers! We thought it'd be fun to invite you into our office to show you how to make a high protein green smoothie. If you’ve never tasted homemade almond milk, beware. You’ll never want to go back. It’s fresher, you can control the amount of sugar, and actually tastes like almonds! We swear it’s easier than you’d think. Store in an airtight container. Fresh almond milk only stays good for a few days. You can drink almond milk by itself, pair it with granola, or use it to make smoothies like this amazing Almond Butter Maca Madness smoothie. You can also dehydrate or toast the leftover almond meal and blend it to make a gluten-free flour! This recipe is perfect if you’re new to green smoothies. Romaine lettuce is so light, you'll barely notice it's there. Cucumber is refreshing while also packing in B vitamins and skin-loving silica. The fruit brings Vitamins A and C, plus it makes the taste nothing but yummy. Directions: Just blend up and enjoy! For more smoothies recipes from our team, check out this blog post. For yummy soup recipes (some of which you can make in a Vitamix), check out this blog post. Thanks for reading and watching, click here to subscribe so you never miss a We Heart! It would take a lot of guesswork out of this recipe if you could be more specific on ingredient amounts. That way everyone has a higher probability of arriving at a smoothie as tasty as the one you have enjoyed. Heads of romaine vary greatly in size, as do the fruits listed and the sizes of bags they come in. Thanks for your interesting blogs. I bought a Vita Mix a long, long time ago and would never be without it. It’s great for quick smoothies, dressings, soups, etc., A regular blender no matter how expensive cannot compare. A Vita Mix lasts forever and the folks back at Vita Mix couldn’t be easier to deal with. I bought one for my brother and his wife as a gift and they love it. Like me, they would now never be without it. I just got my Vitamix last week and absolutely LOVE it!! I’ve spent so much money on inferior blenders and juicers and now this just does everything! I did buy a reconditioned one through Vitamix. It’s a little easier on the pocketbook and you still get a 5 year warranty. I also got the 5200 model. And everyone at Vitamix is a pleasure to talk to. I think they have free shipping right now as well. Great recipes – thanks for sharing!